UNISWAG KICKS is the newest addition to the UNISWAG brand. This is your go to source in the latest trends and drop dates for the newest kicks to hit the street. The NBA season is back which means LeBron’s shoe game on the court will be something to watch. In 2003, Nike released an ad which LeBron sat on a throne wearing Red velvet and Gold with 3 Lions at his feet. On opening night for the Lakers, Nike is set to release the “King” edition of the LeBron 16. Dressed in Burgandy, Gold, and Cheetah print on the heel; this shoe gives off a vibe that is only suited for a King. These are set to drop at 10:30 ET, which is the tip-off time for the Lakers x Trailblazers game. Puma is making a return to the basketball court. They made a big splash by signing 3 of the top athletes in the rookie class in Marvin Bagley III, DeAndre Ayton, Michael Porter. Taking pieces from the classic Puma Clyde this version features a knit upper and the brands new hybrid cushioning technology that focuses on modern-day performance. Decked out in a bright Red-Orange & Yellow upper, the Clyde Disrupt also features a Black knit formstripe graphic with the year “1973” stitched on the heel tab, the year the first Clyde was released. Another installment to the KD 11’s are set to drop at the first of the month. 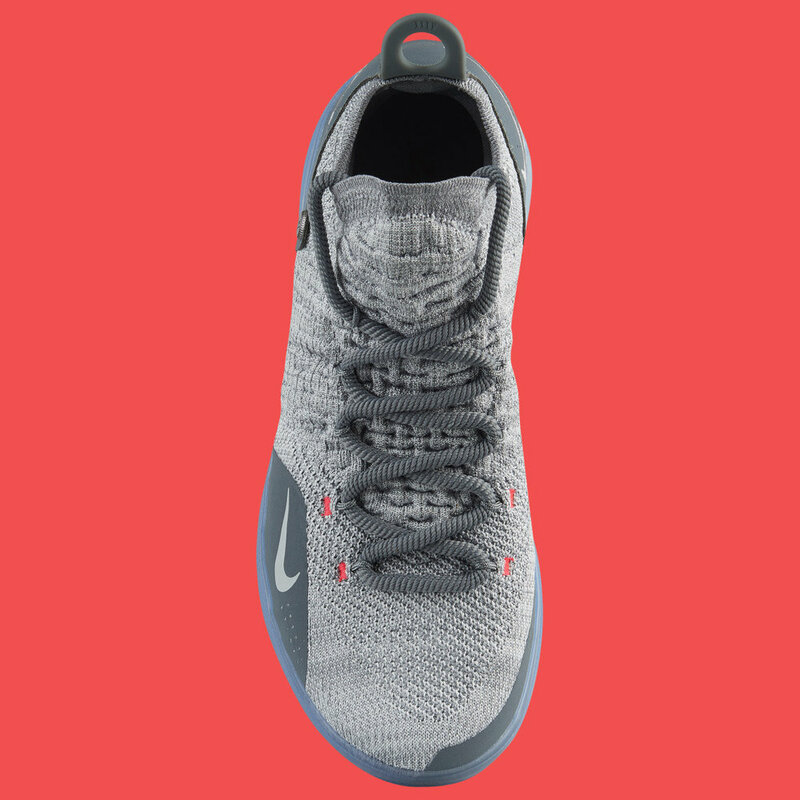 Given the name, this shoe rocks a color scheme that features both Wolf Grey & Cool Grey along the upper. Hints of red can be found in the stitching towards the front of the shoe and on the heel. 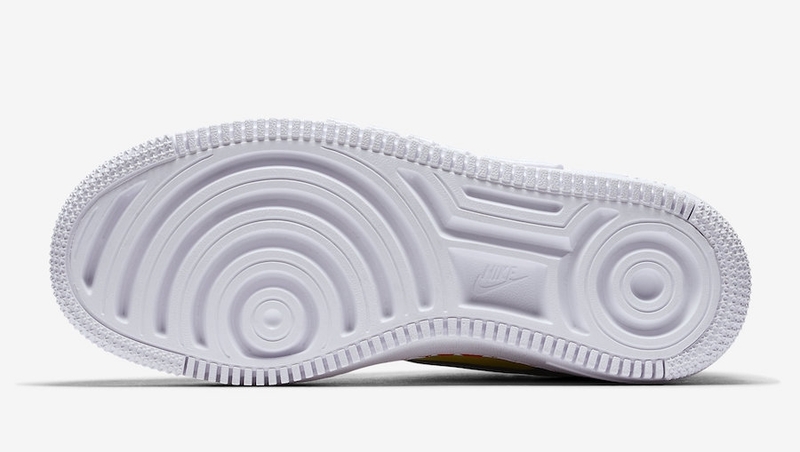 To finish it off, Nike puts the clear sole on the shoe just like the “Cool Greys” found in the Jordan collections. The LeBron 15’s are back but this time in the Low cut which is dressed in University Red & White. Black accents can be found in the speckles lined across the midsole, the tongue & heels tabs of the shoe. With White laces & the Metallic Red Swoosh on the inside of the midfoot this LeBron Low packs a lot of flavor & will for sure fly off the shelves. Nike Air Max 90/1 " Purple Basalt"
Nike seems to be right on track with the Air Max 90/1, which first debuted back in 1992. The hybrid Air Max featured the upper of the Air Max 1 placed on top of the Air Max 90 sole unit. As Mike Jones said, “back then they didn’t want me, now I’m hot they’re all on me”, the Air Max 90/1 is now a fan favorite. With the next upcoming release, this all suede shoe will be decked out in Purple, while Black can be found in the Swoosh & the OG Nike logo stitched on the heel. The White midsole brings this shoe to life. Bodega is teaming up with Adidas to put their touch on the new soccer lifestyle shoes, the Kamanda & Sobakov. First up is the Kamanda, which features a Core Black mesh upper instead of the traditional suede. Hints of Khaki can be found in the stitching of the shoe & also on the heel tab which keeps the traditional suede. Bodega’s branding is plastered on the bottom of the translucent black sole in Orange writing. Next up are the Adidas Sobakov. This all suede Khaki colored silhouette packs a nice punch with Bodega taking the midfoot The Stripes into their own hands. The wavy looking stripes wrap around the shoe so it’s featured on both the inside & outside. Orange is found in the laces, inner lining, and tongue tab which is marked with Bodegas branding. Just like the Kamanda, Bodegas branding is also on the bottom of the translucent sole. Adidas is hitting the soccer lifestyle shoes hard this fall. Going back to the all suede silhouette, the NEIGHBORHOOD x Adidas collection utilizes the military style colorways. With an untraditional lacing down the side of the shoe, the NEIGHBORHOOD branding is placed on the toe and runs along the inside of the shoe in Old English font. These will be available in both Military Green & Black. Inspired by his alma-mater, Nike is releasing a version of the PG 2.5’s decked out with Fresno States colors & accents. The mix of a mesh & leather upper are Gym Red, while Navy Blue accents are found on the swoosh & tongue which happens to be the mascot of Fresno, the Bulldog, and PG’s #13 is placed on the insole. The White midsole & icy translucent outsole puts the finishing touches on this PE. The low cut version of the Kobe AD is set to release at the top of the month. The flyknit construction makes up the whole sneaker mixed with the a plethora of colors, and is combined with black and yellow detailing. Placed on the heel are Kobe’s “Sheath” logo & signature “Achilles Stitching”. The NXT 360 also features both Lunarlon & React foam, which makes this shoe one of the most comfortable you can wear on the court. Jordan is teaming up with one of the best BMX riders in the game, Nigel Sylvester. With the Air Jordan 1 being his go to riding shoe, it’s only fitting that he gets his own collab. Nigel doesn’t use breaks when he rides, so instead he uses his shoes to slow down. With this Air Jordan looking worn down, scuff marks are found on the toes and heel of the shoe. The swoosh goes from white to silver from the outside to inner medial of the Retro 1, and is finished off with a black tongue and red outsole. KITH & Extra Butter had a special early release of the Nigel x Air Jordan 1 and it will finally get a global release on the 1st of September. 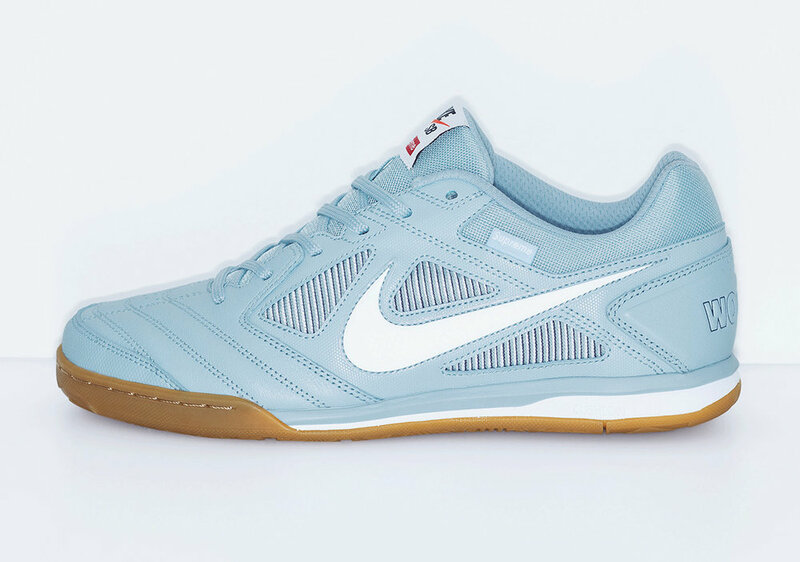 Supreme and Nike are teaming up again to bring back the indoor soccer shoe that was eventually molded into a skateboarding sneaker. With both sports relying on the skills of the feet, the Gato is perfect for optimal feel which made the transition of the shoe seamless. Surpreme's branding is found on the tongue patch, and tags on the upper medial of the shoe. To give it an extra touch, “World Famous” is stitched on the heel of the shoe. These will hit the shelves in 4 colorways – Black, White, Red and Light Blue. 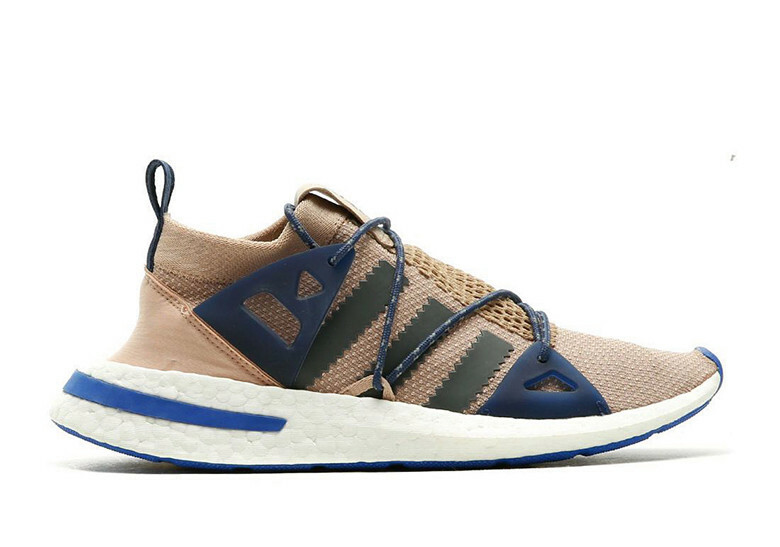 The upper of the “HFR” is covered in Tan Battleknit 2.0, gold accents and comes with Brown & Tan interchangeable leather straps, which double as bracelets. Writing of the words – Strength, Courage, and Dignity, which described what LeBron thinks of African American Women can be found on the inside of sole. Lastly, a Lion’s head is molded onto the heel of the shoe with its mouth open showing the aggressive teeth the animal has, which holds the laces in place that wrap around the shoe. These will only be available for women with LeBron having the only pair in a men's size. 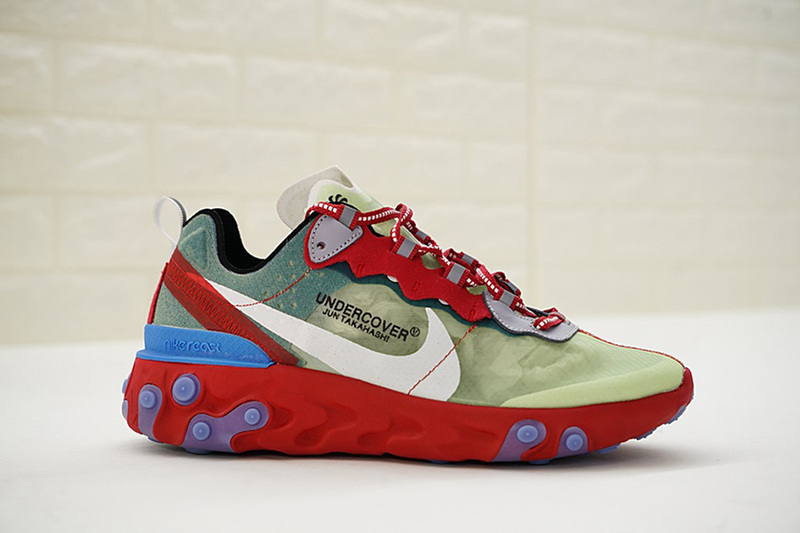 UNDERCOVER & Nike are connecting again on a collab on one of the hottest shoes to release in 2018, the React Element 87. 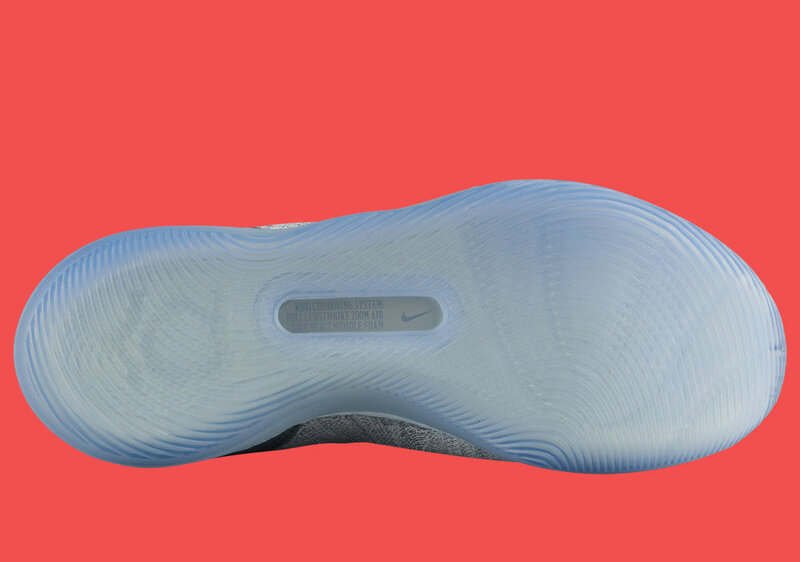 With a translucent upper and taping on the heel this shoe is finished off with Nike’s new React foam technology. The deconstructed shoe which is decked out in a variety of colors is set to hit the shelves on September 13th. Ladies only! The “Tartan Pack” is set to have 3 of Nike’s best sneakers, the Air Max 91, Air Max 1, and Air Max Plus. 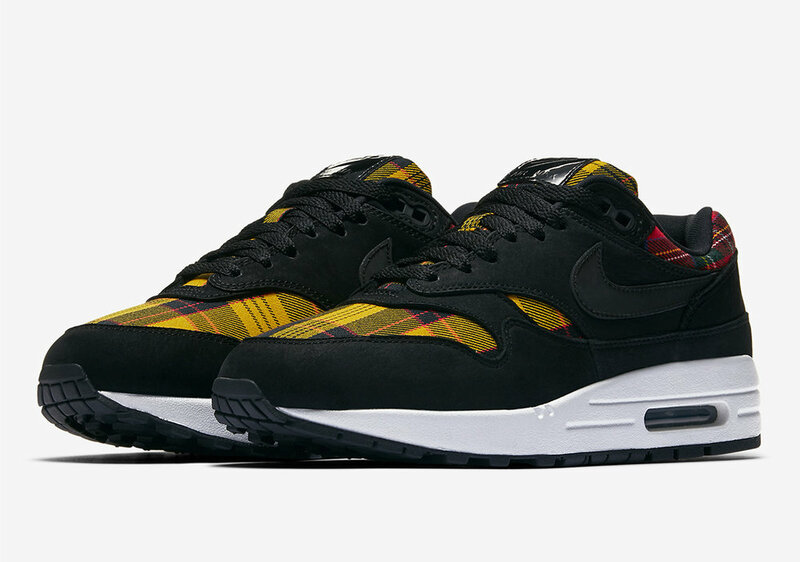 These will feature Red & Yellow tartans, which will be laid across the upper of each Air Max. Each pair has their own vibe heading into the “fall” look. Each shoe is dressed in Black which makes the plaid design stand out, and is also followed up with a Black Air Max unit. Look for these styles on the Nike SNKRS app. Another Virgil Abloh x Nike collab is set to drop. Dubbing this drop as the “Spooky Pack” the colors of each shoe gives you that vibe right before the Halloween month hits. 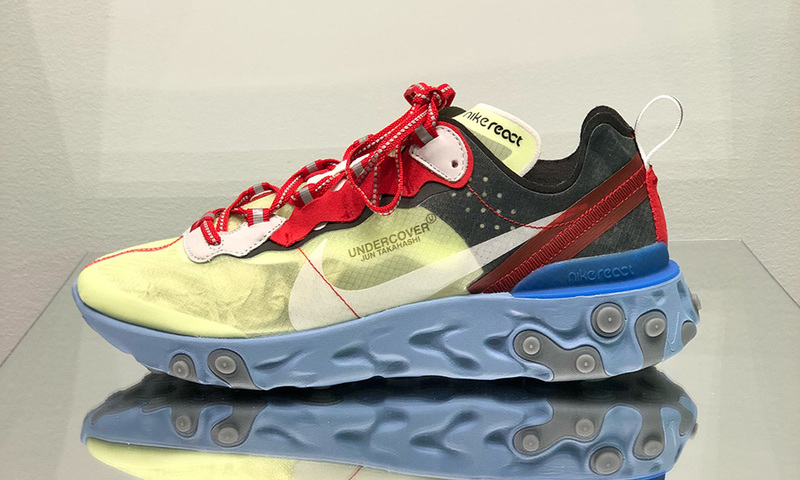 The shoes will both feature a mixed material on the upper, with the oversized rubber Swoosh wrapping around both sides. OFF-WHITE branding can be found on the medial sides & the Blue Powder zip tie replaces the original Red tag. UPDATE: Both pairs will be releasing on October 3rd. Kevin Durant x Nike are planning to release the next installment of KD's signature shoe, which is dedicated to the youth hoops organization. The base of the shoe is packed with Hot Punch while Lime-Blast & Pure Platinum gives this it a nice summertime look. The bright multicolor sneaker features a peach logo embroidered on the heel that honors the annual Peach Jam Tournament which is held in Georgia. Lastly the translucent react cushioning sole on the KD 11's put the finishing touches on a shoe that will turn heads throughout the summer. Pharrell is making a case for himself as being one of if not their top celebrities tied with the brand, as he starts another collection. The "Ambition" collection dives into the Crazy Boost, while still using the style guide of the BYW legacy. 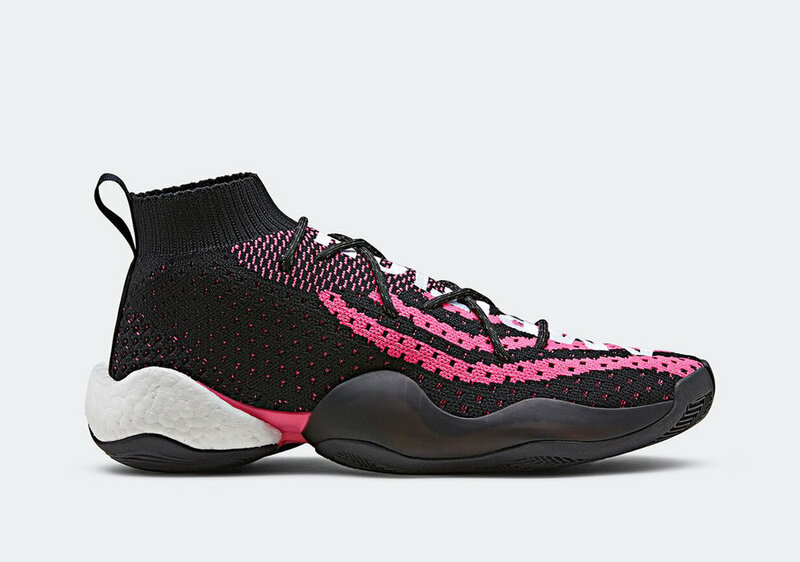 The new BYW LVL has Boost technology along with Adidas' new podular construction which brings comfort for the consumer but still being able to catch others attention. You will be able to choose between two colors, black and pink which will have "AMBITION" placed down the center of the shoe, similar to Pharrell's Hu Race collection. 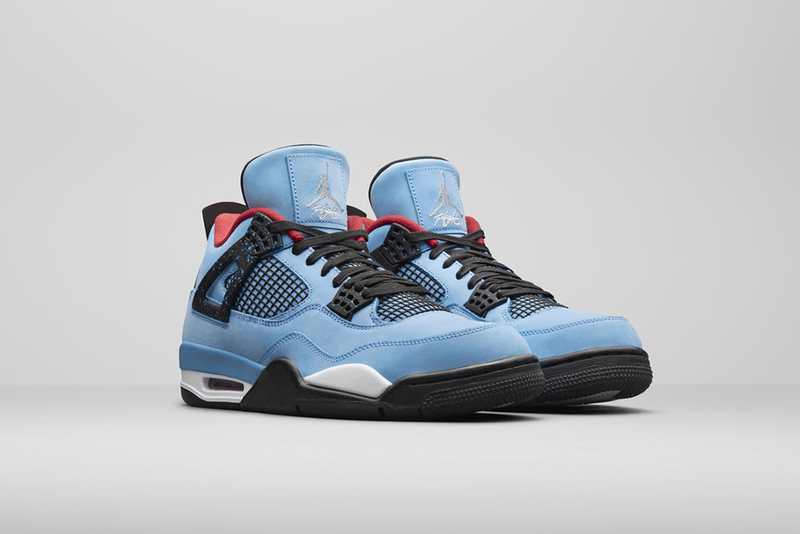 Travis Scott x Air Jordan Retro 4 "Cactus Jack"
The Houston native rapper is teaming up with Jordan and is ready to drop their first collab. Decked out in university blue, red lining and black features throughout, this shoe pays homage to one of his favorite teams - the Houston Oilers. Travis' "Cactus Jack" logo can be found on the left heel of the shoe and the OG Nike logo on the right heel. Inside of the right tongue an upside down "H-Town" replaces the other Air Jordan tag. Air Jordan Retro 12 "Michigan"
The iconic Navy Blue and Maize color combo will be coming to the Retro 12. With Michigan being the first Jordan Brand school, it's only right that they bless the shoe with this colorway, and pay homage to the Wolverines. 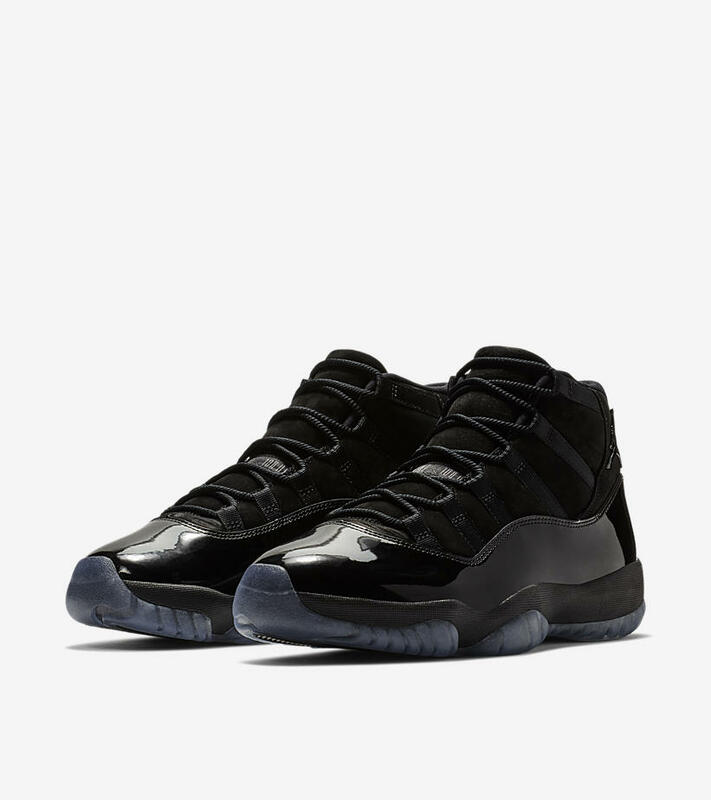 Dressed in a Navy Blue upper and midsole, this shoe features Maize accents throughout that can be on the Jumpman tag, top two lace holes and the Michigan logo on the right tongue of the sneaker. 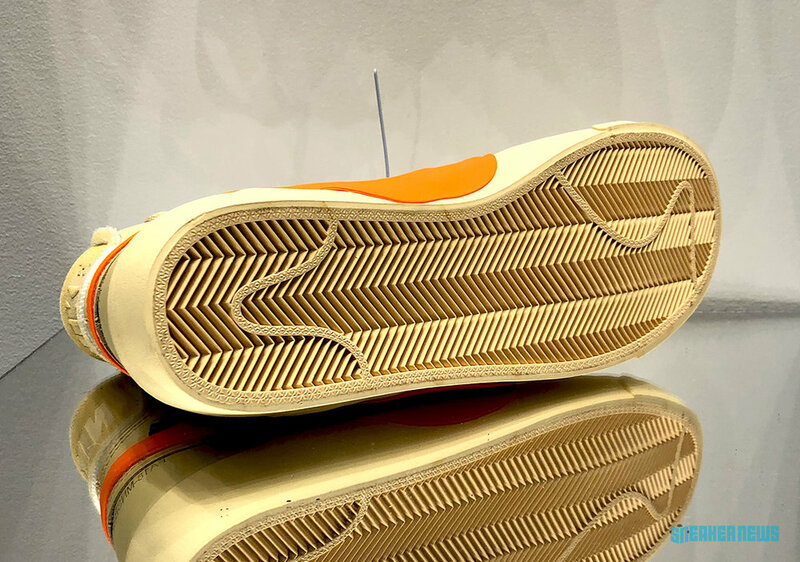 This release will be a tad different from the PSNY x Jordan PE, which featured deep ridges in the upper of the shoe along with the Maize heel tab. Nike Inneva Woven Vapormax "Navy"
Kith's Ronnie Fieg previewed the new Woven Vapormax on his Instagram a few weeks ago. With official images making it's way around the internet, Nike is ready to drop not one but TWO pairs in White and Navy. 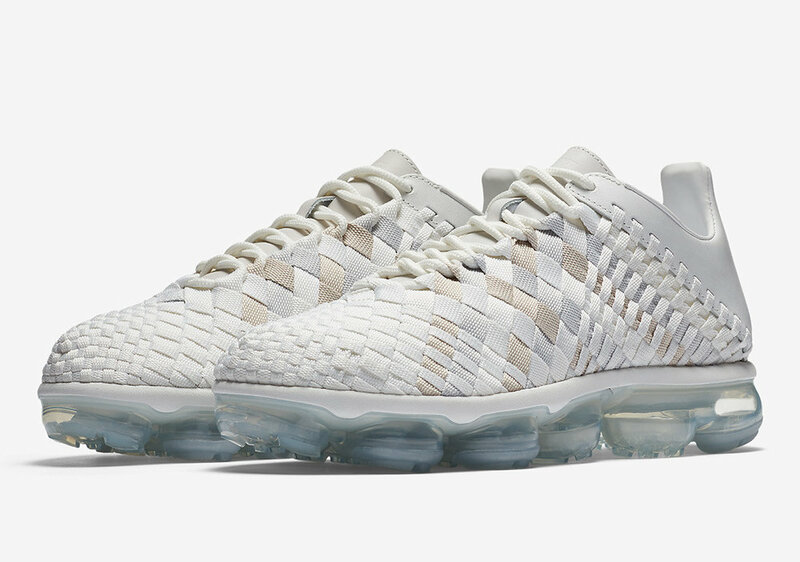 The shoe keeps its clear Vapormax unit with the woven upper, but the heel and collar are made from suede , which replaces the leather on the "White" version. 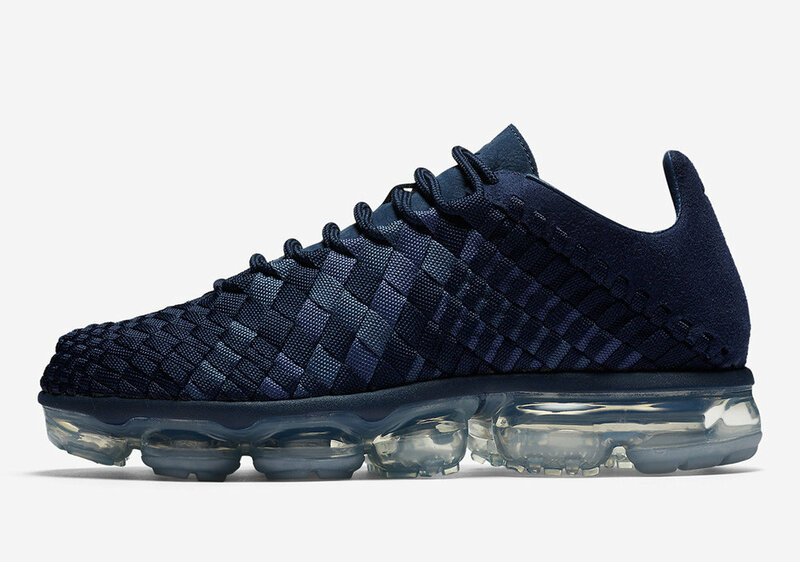 Nike Inneva woven vapormax "white"
With the "Navy" pair making its debut the same day. The woven detailing really showcasing in the "White" version, this unique Air Max hybrid is ready to make a splash in the sneaker world. 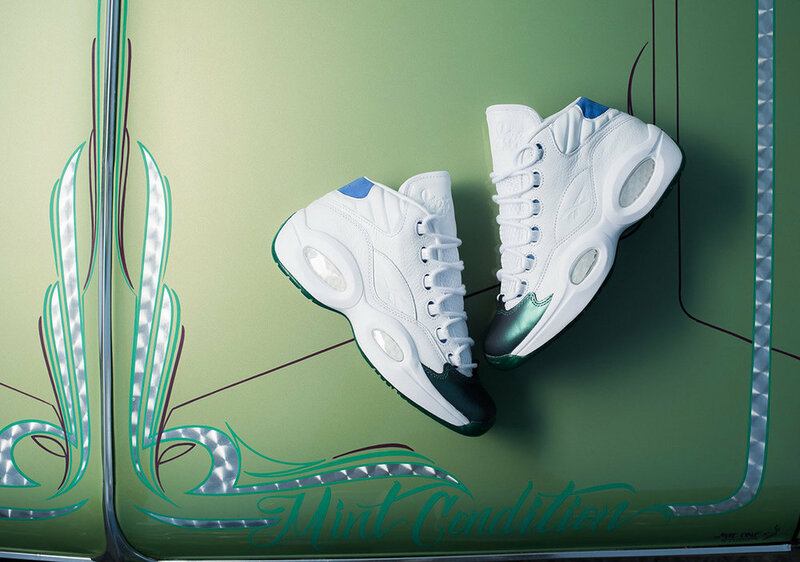 Curren$y, Reebok, and Sneaker Politics are coming together to make a weed-themed collaboration for the Question Mid. With an all white leather upper and a iridescent teal on the toe and outsole; Jet Life, which is Curren$y's record label is also featured on the tongue with a "stash-pocket" for your necessities. Curren$y's passion for old-school American Muscle Cars and Low-Riders steals the show with a special packaging that mimics a green Low-Rider with blue detailing which matches the insoles. "Jet Life" Branding can be found throughout the box. Pairs will arrive on May 4th online at Sneaker Politics and will hit the global market on May 11th. Adidas x Pharrell are set to drop the next installment to the Human Race collection, which will be released exclusively in China. This collection features four different styles: "Happy", "Passion", "Peace" and "Youth" embroidered on the upper of the shoe. This set of NMD Hu's have the same feel as the first Adidas x Pharrell collab from 2016. Air Jordan 11 Low "re2pect"
Other than the GOAT himself, Derek Jeter is the most well known Jordan Brand Athletes. The "RE2PECT" campaign in honor of Jeter's legacy has seen some of the most highly exclusive Jordan releases to date. Dressed in all navy suede with leather laces, a white-gum sole & The Captains branding on the heel, this Air Jordan 11 Low will be Jeter's highest profile release & will be available for large quantity, so plenty of consumers should be able to get their hands on a pair. Virgil Abloh is teaming up with the Converse family for a Chuck Taylor x Off White collab for the next installment in "The Ten" collection. This classic sneaker features translucent uppers that displays the inner workings of the Chucks, Vigirl's signature "LEFT" & "RIGHT" tagging are placed on the opposites of the correct toe cap of the shoe, and the branding on the heel of the shoe is placed upside down . These will be available in stores as well as on Converse.com & and Off---White. Update: Released on May 8th @ Nike.com. Releases on OFF WHITE and select retailers still to come. 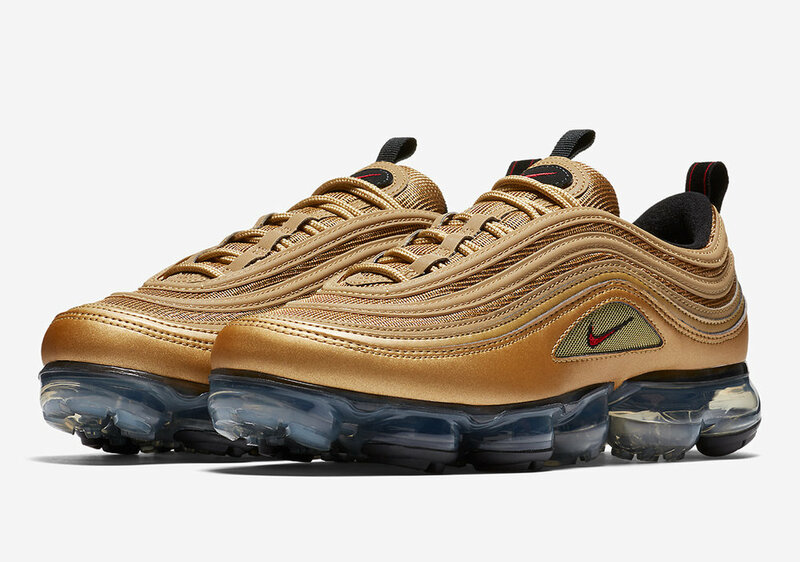 Nike Vapormax 97 "metallic gold"
The OG Metallic Gold colorway will be featured on three different Air Max's dropping next week. First up are the Vapormax 97's, similar to the "Silver Bullets" this shoe is covered in a gold upper with red accents found on the Swoosh and stitching on the heel tab. Last but not least are the Air Max Plus, which will be hitting the shelves once again. Dressed in metallic gold with red accents throughout. The most well known sample of the Retro 11 that sold on eBay for $11,000 back in 2012 is being made for the masses. 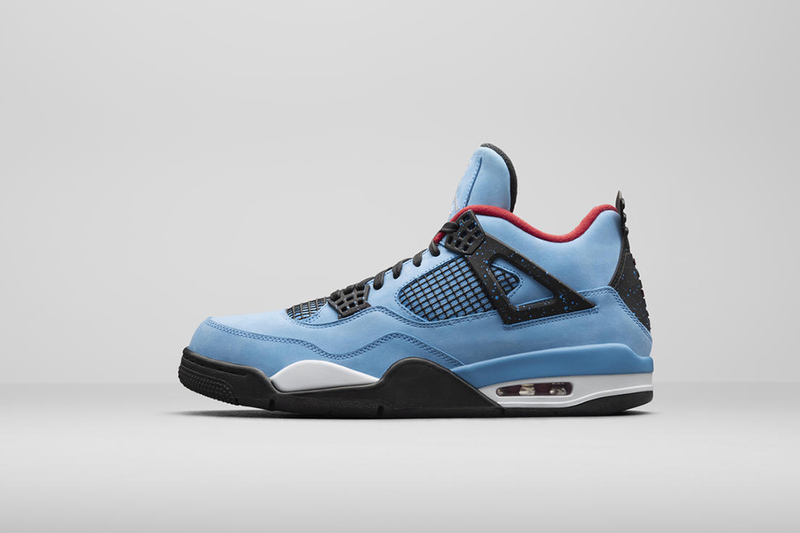 Consumers have been craving for this colorway and will finally be blessed. The all black silhouette shoe will be dressed in a nubuck upper & the classic patent leather midsole. Topped off with an icy outsole, this Jordan is graduating in style. Jordan is throwing a unique shoe our way with the “Home To Homage” Retro 1’s. The “Banned” and “Chicago” colorways are meshed together, and features the tags “From” and “For” on the heels. The first release of the shoe will be limited to 2,300 pairs; and will drop again on May 19th, but will not feature the tags on the heel. The Jordan 10, which pays homage to Michael’s accomplishments is debuting a new colorway. Dressed in a dark gray suede upper, black midsole & black/gray outsole. The red Jumpman accents gives this shoe pop but still keeps a stealth look. The Cool Grey is coming back to the Jordan 11’s, but this time with the low cut. 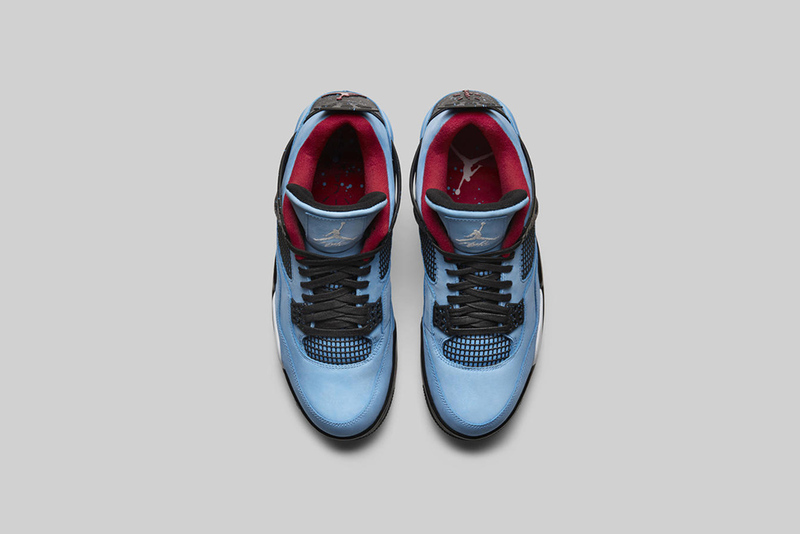 This colorway is one of the most popular & classic designs to the Jordan Brand. Air Jordan 9 "MOP Melo"
The Jordan Brand plans to pay homage to Carmelo Anthony’s 2003 National Championship with Syracuse. During their Championship run, Melo was named Most Outstanding Player. 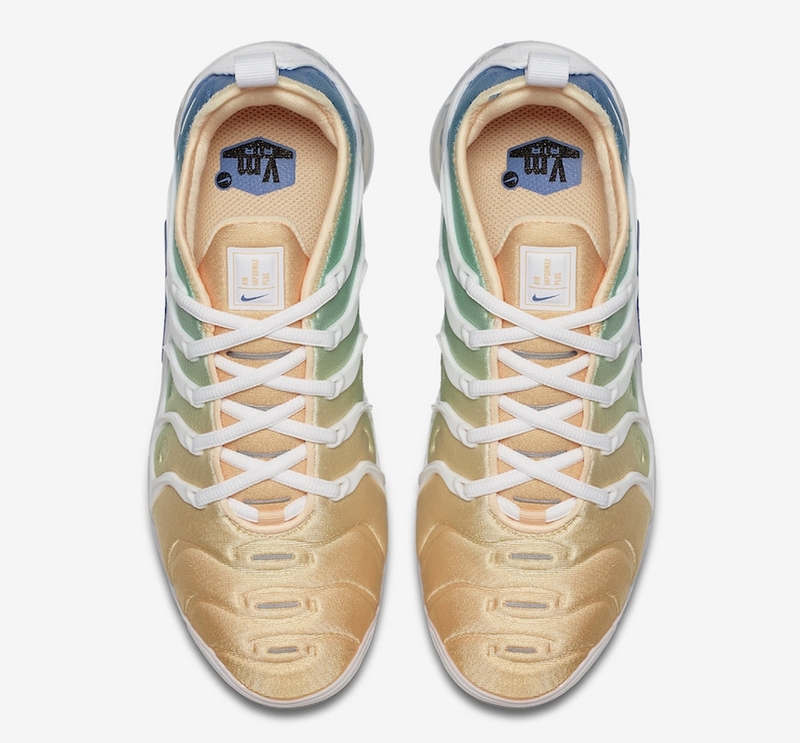 The shoe features a wood grain overlay and metallic gold midsole which mimics the “MOP” trophy. Melos number “15” replaces the 23 on the heel while his script logo can be found on both insoles. LeBron is preparing to go “dark” as the NBA regular season is coming to an end. Every year Bron shuts down his social media accounts so he can “lock in” & prepare to go on another Title Run. He calls this mode “Zero Dark Thirty.” Nike will debut the new Soldier 12, which features an Anthracite & Black upper with a mix of suede on the toe of the shoe. 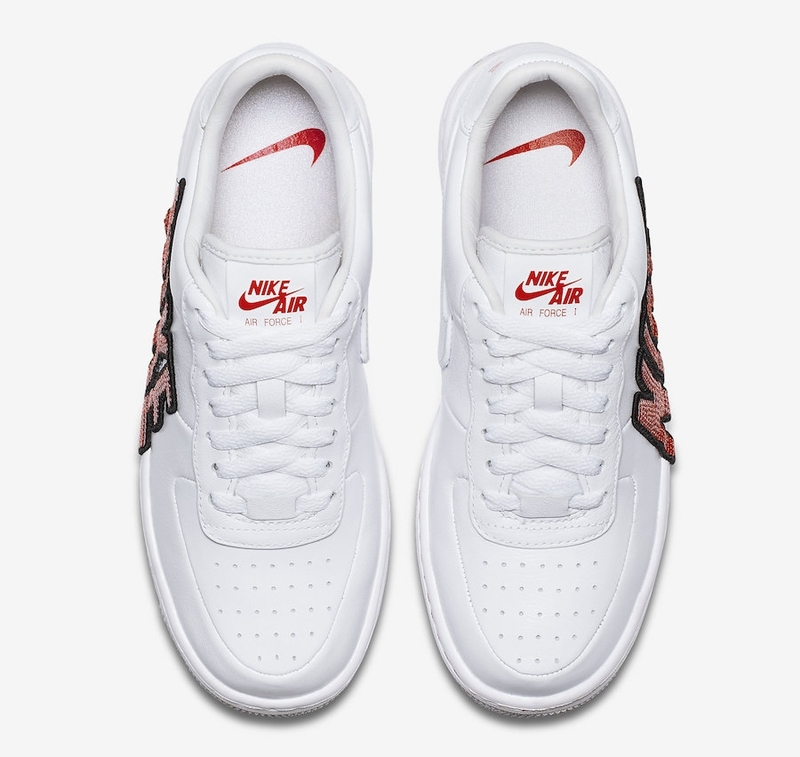 The Swoosh is located across the midfoot strap with 3M detailing. The Air Max 97 pays homage to the Miami “Vice” lifestyle by featuring a White upper with Kinetic Green & Pink Blast on the gradient designed upper. The air unit and laces boast the Kinect Green while the Pink Blast showcases on the Swoosh. 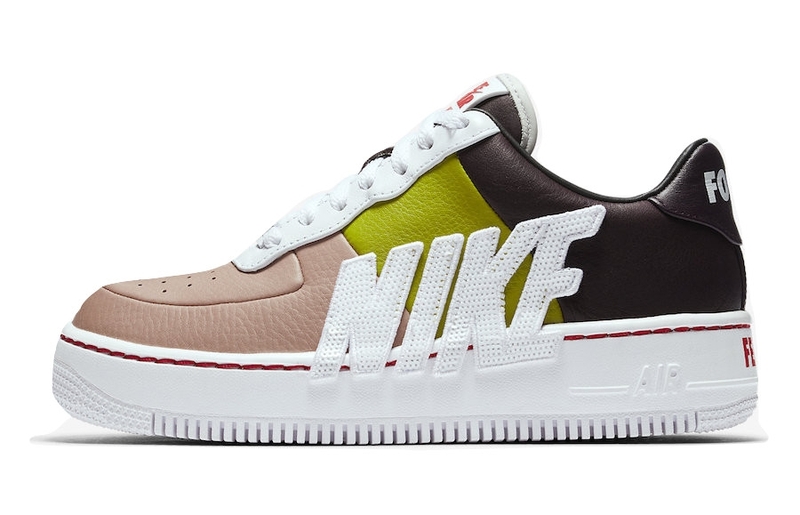 This Women’s version of the Air Force 1 is covered in 3 different colors throughout the upper: Port Wine, Bright Cactus & Peach. On the heel of the shoe reads “Force Is Female”. Across the shoe outside of the shoe are the OG Nike logos while the Swoosh is hidden on the medial side. The sneakers will also come with a Nike shoe bag. 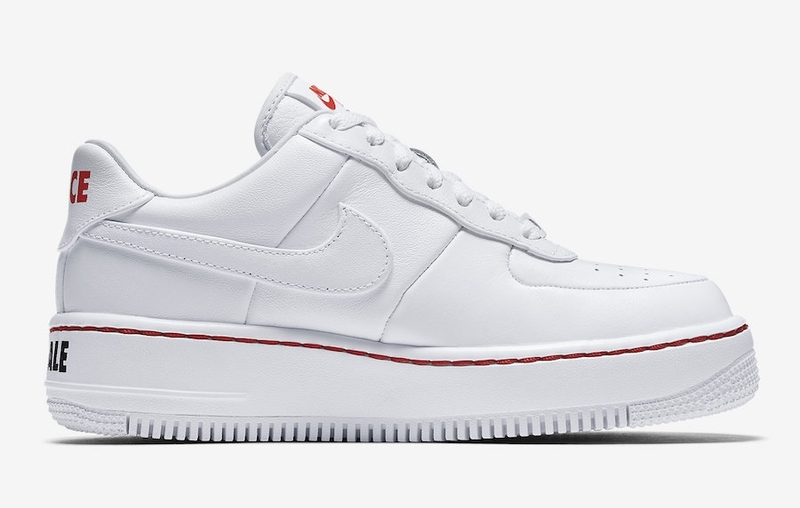 The second version of the Air Force 1 Upstep is an all-White leather upper with the OG Nike logo in Red and the Swoosh in White. 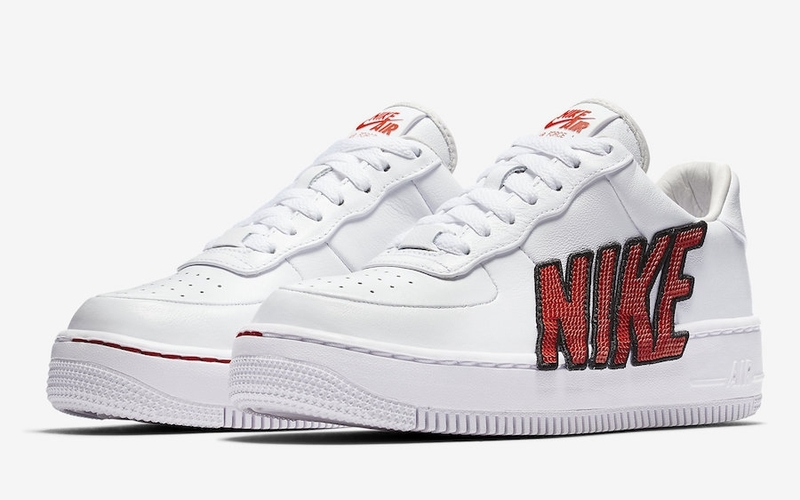 “Force Is Female” text takes on the color of the shoe being written in Red & Black. If you look closely you can see the stitching on the heel got from White to Red on the left and Red to White on the right. The Trefoil Brand is set to debut the new Adidas Akryn with a Boost sole. While keeping an NMD look with the mesh upper and sock-like design , the Akryn is best known for the lacing system with 3 eyelets on each side with one extending to the Boost midsole. The tongue features premium leather showing the brand’s history with most of it being written in German. 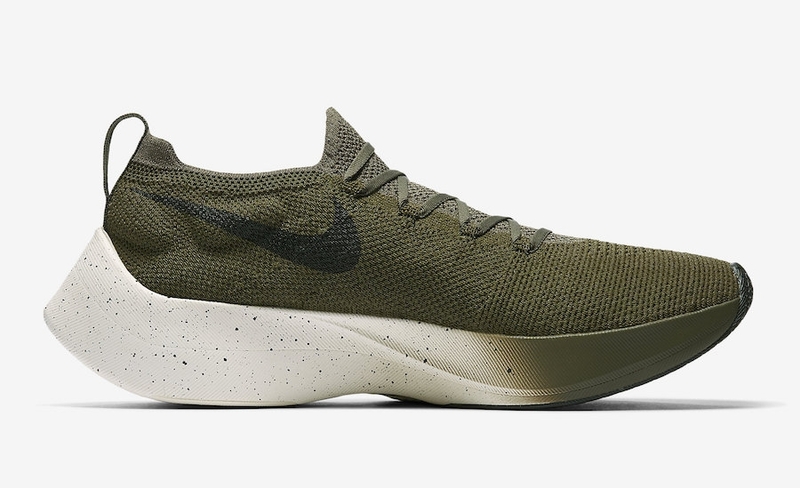 The Vapor Street Flyknit is Nike’s premier performance to lifestyle crossover shoe that is based off the VaporFly Elite 4%. This version comes with a mixture of River Rock, Cream, and Sail accents on the Flyknit upper and a cream speckled sole. 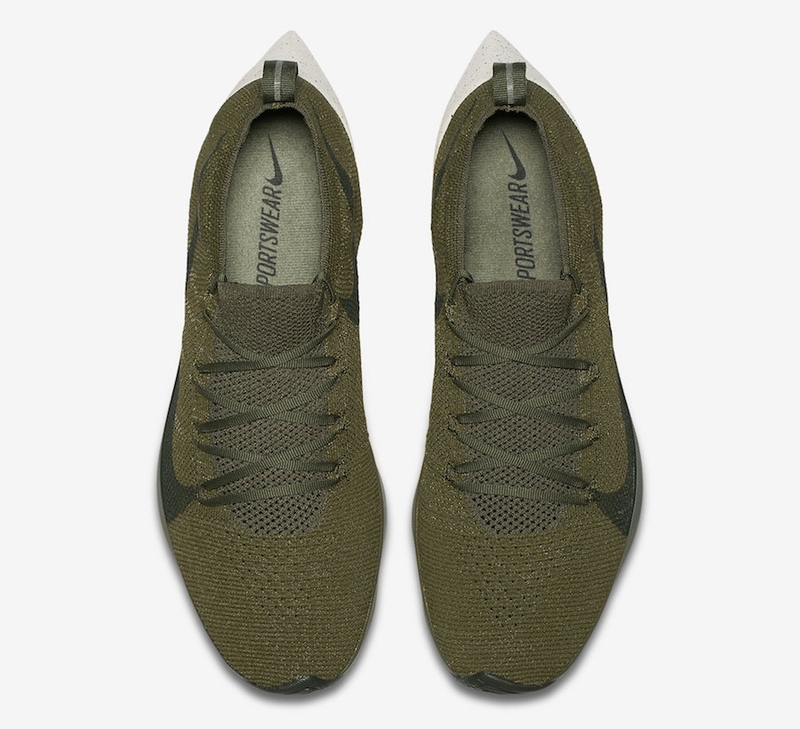 Dropping along side the “River Rock”colorway, the Vapor Street Flyknit is blessing us with an “Olive“ version. 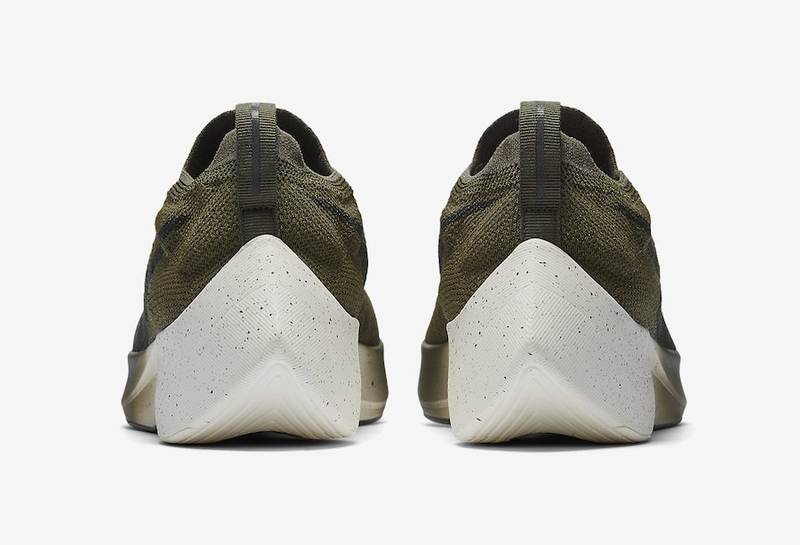 It has the same features but instead the sole fades from Olive to Cream & speckles, front to back. VaporMax continues to experiment with the Air Max collection. 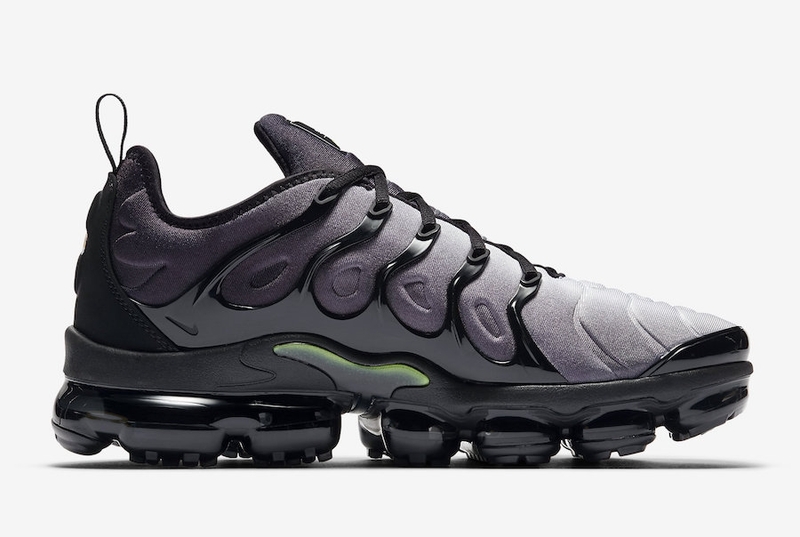 The VaporMax Plus gets a Black, Volt & White colorway with a “smoke” like gradient upper which fades from White to Black. 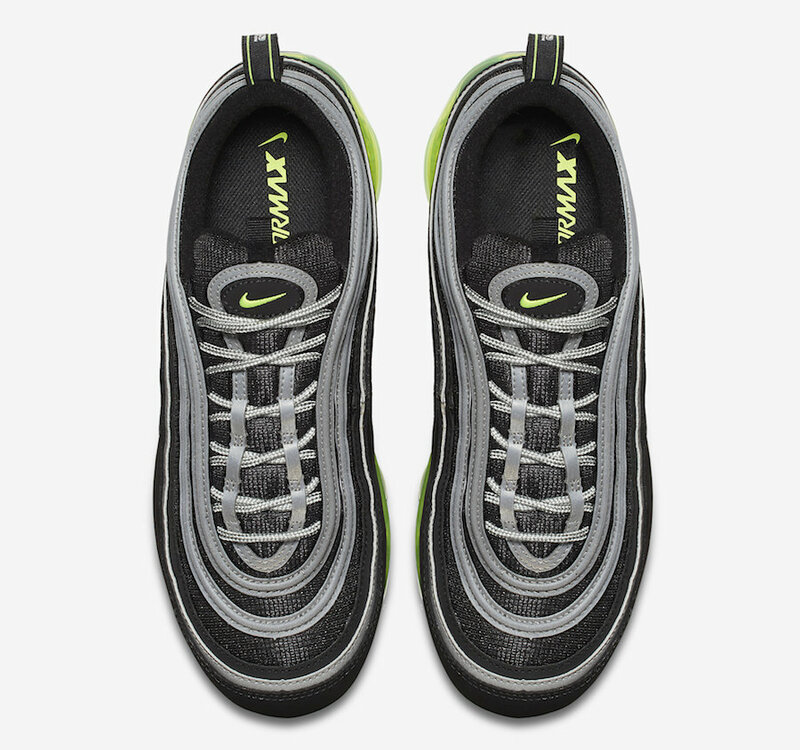 The Volt accents are found on the Swoosh and midsole. It will also feature a 3M Reflective tongue and the “VM” logo on the heels. 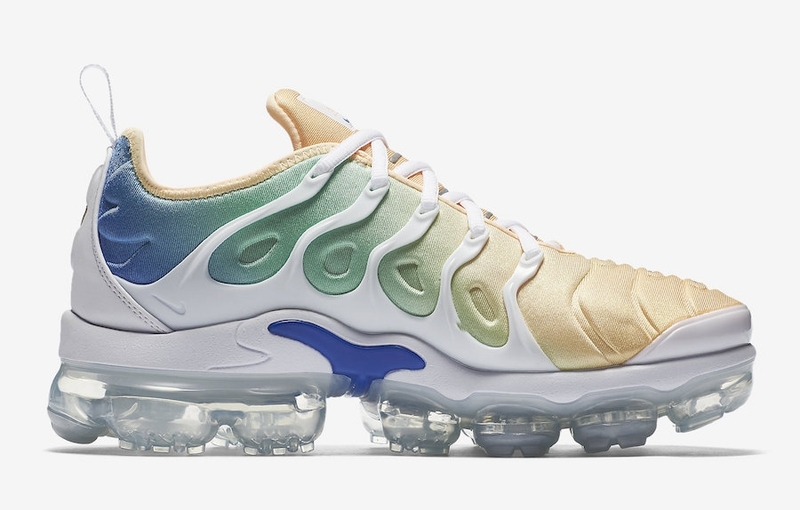 Nike will be dropping a Women’s version of the VaporMax Plus dressed in a mix of White, Total Crimson, Light Menta & Light Racer Blue. Keeping the same gradient upper which fades into each color. 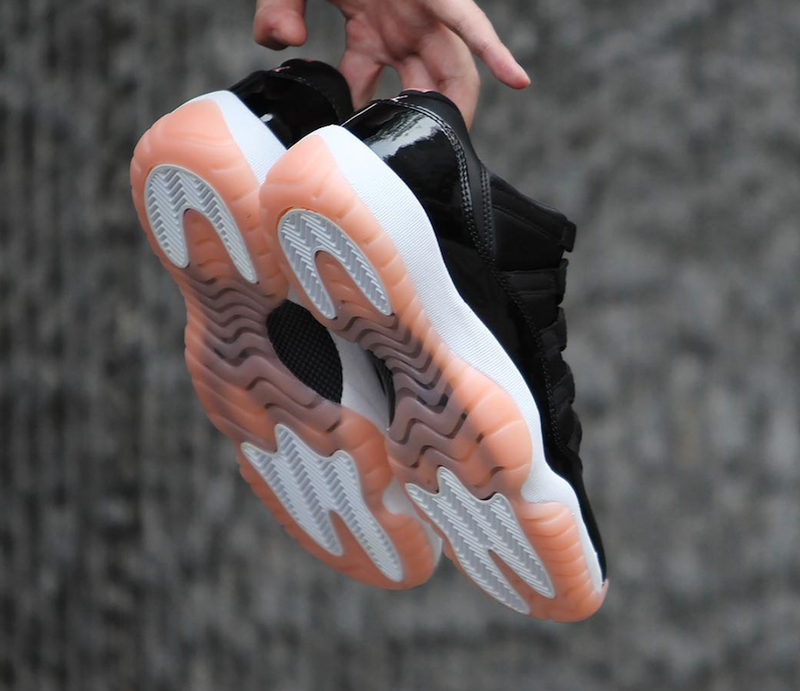 The Jordan 11 Low will be an all-Black nubuck upper & patent leather midsole; with Bleached Coral featured on the tongue branding and the translucent outsole. This shoe is a Grade School exclusive. The return of the Air Jordan 18…and it’s coming in style. The Red Toro is an all Red upper covered in suede while the heel is lined with carbon fiber. 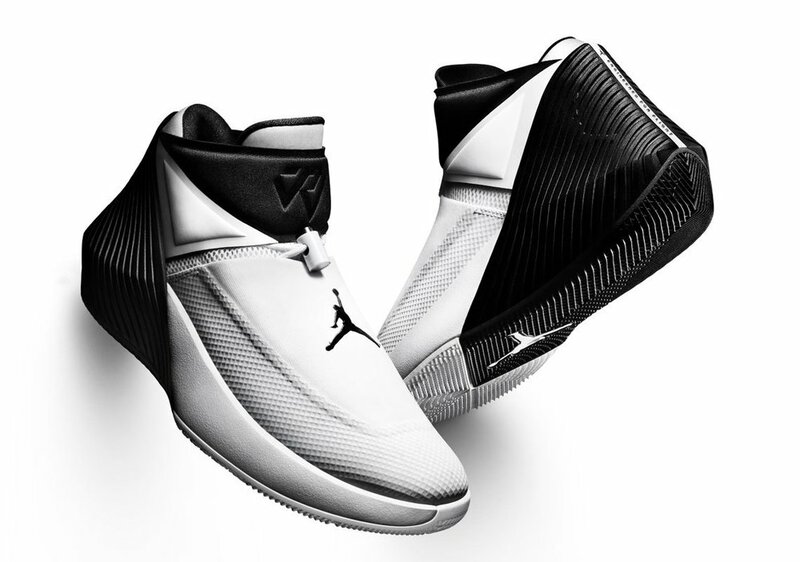 Black accents are found running along the midsole, inner lining of the shoe, and the Jumpman, 23 & Jordan brandings. A White puts the finishing touches on this sleek shoe. Next up for the VaporMax x Air Max 97 mix are the Silver Bullet’s. This classic colorway comes with an all silver upper with a hint of red which is featured on the Swoosh. The Off White x Nike Air VaporMax is set to release the next installation of “The Ten” collection. 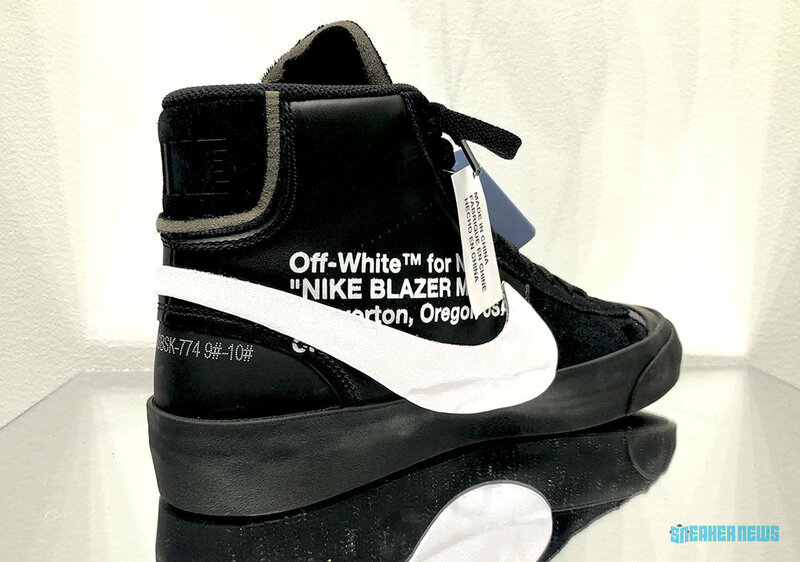 Like the Black pair, the White will feature a Flyknit construction on the upper, Total Crimson tagging, “Air” on the heel of the shoe, and the “Off-White” text located on the medial side of the shoe. PHARRELL X ADIDAS NMD HU "HOLI FESTIVAL"
To continue from last months drops from the Pharrell x Adidas collab, we have a colorful "Pink Glow" theme inspired by India's Holi Festival that takes place in early March. This shoe also features marbled detailing on the bumpers and midsole. AIR JORDAN RETRO 9 "BRED"
This Retro 9 features an all black upper with a shiny patent leather added by red accents which gives it the "Bred" name. The "Seoul" 3's will release exclusively at the Jordan Hongdae store & at nike.com.kr. Paying homage to the 30th Anniversary of two key events - Michael Jordan's dunk contest win and the Seoul Olympics in 1988. With details including the Korean Taeguki flag on the right tongue, Seoul in Korean embroidery on the inner the tongue, & the 1988 Olympics motto, "Harmony and Peace" on the inner right tongue. 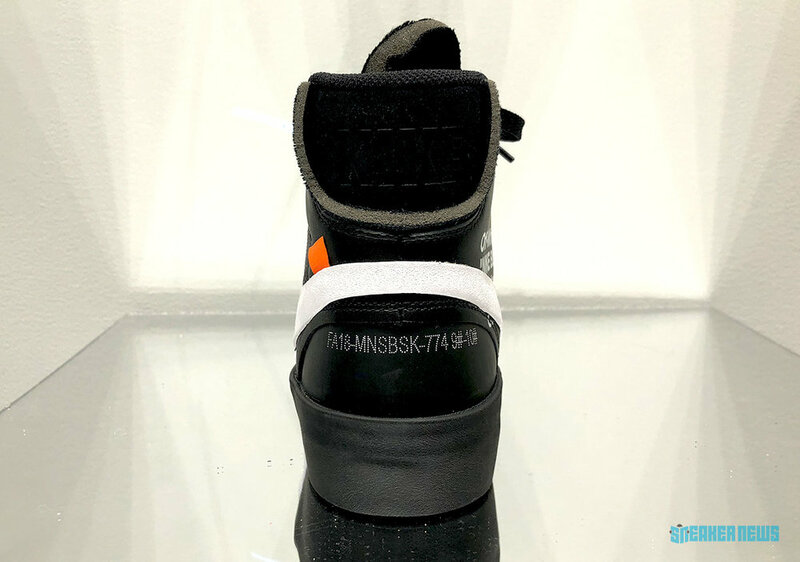 The shoe comes out right after the conclusion of the 2018 Winter Olympics and is said to be extremely limited & will not release outside of South Korea. 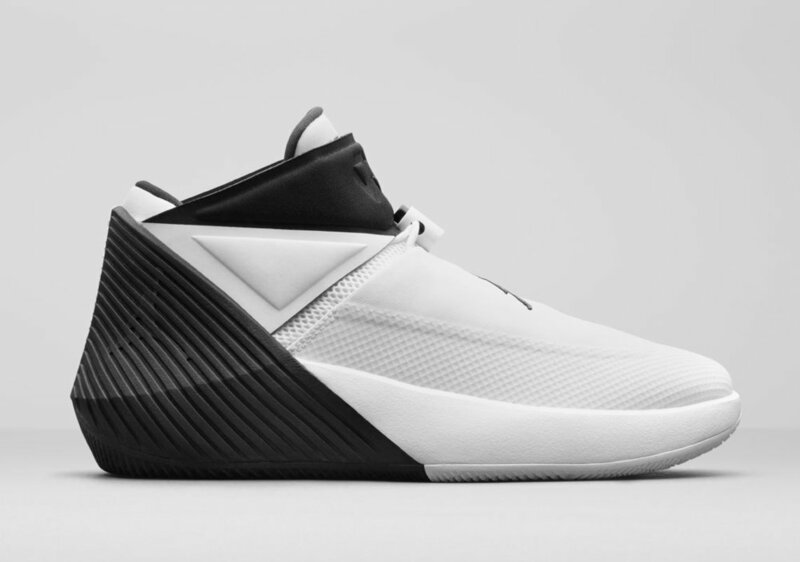 JORDAN WHY NOT ZER0.1 "TRIBUTE"
The next color way of Westbrook's signature shoe is set to drop. Giving us a navy-blue look with a dark cream tint speckled heel, and gold accents for the Jordan/Westbrook logos. The final NMD "Holi Festival" shoe to drop will be the "Flash Green." With the appearance of being worn during Holi, Pharrell throws in the custom colored powder that represents the festival. It also features embroidery on the uppers in both English & Hindi. AIR JORDAN 9 "I'M BACK"
In honor of Michael Jordan's surprise return to the Bulls in 1995, the Jordan brand is giving us a Retro 10 with an all-white base mixed with a black suede upper, & red stitching on the pull tabs with "3.8.95" & "I'm Back." AIR JORDAN RETRO 3 "FLYKNIT"
The Air Jordan Flyknit is set to take a stab at the Retro 3. The Flyknit upper accentuates the famed elephant print on the toe & the heel. It also keeps is old school look with the leather interior lining & classic sole. NIKE AIR MAX 270 "TEAL"
The next wave of the Air Max 270's are set to drop on Air Max Day. As a tribute to the Air Max 93, one of Tinker Hatfield's classics, Nike will be releasing the Air Max 270 in the original Teal color way of the iconic '93. NIKE AIR MAX 270 "ULTRAMARINE"
Paying respects to another original Nike Air Max, the ultramarine and solar red colors gives you a taste of the Nike Air 180 which helped inspire the design of the 270 silhouette. The vibrant solar red in on the Air unit & the inner bootie, while the ultramarine accents are found on the Swoosh logos & lace eyelets. Nike continues to push the limits with the mixing of the Vapormax and Air Max lines. Hoping in on the fun is the Vapormax 97, which features the upper of the 97 model onto of the Vapormax sole. The first color way will be the Air Max 97's OG Japan Color way. Nike’s first 100% lifestyle Air shoe. The Air Max 270 is still designed for sport performance but with the demands of all-day wear. Inspired by the Air Max 93 & Air Max 180. 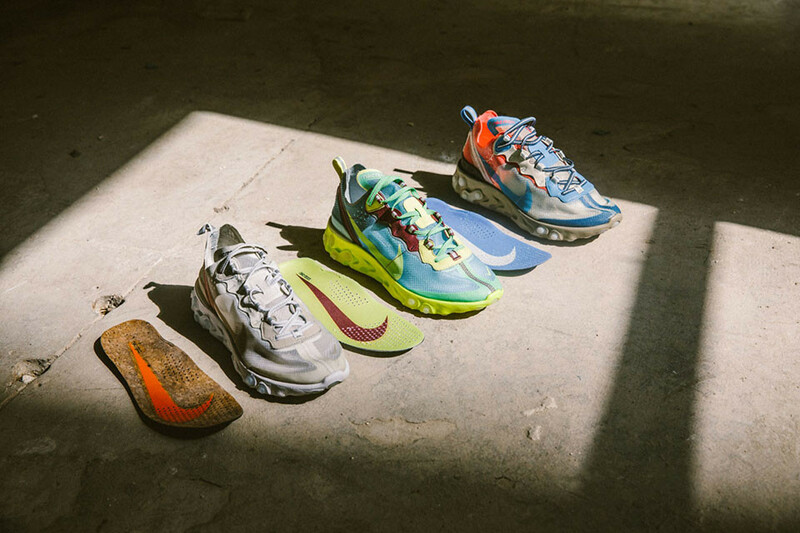 270 comes from a nickname for the Air Max 93 which referred to the degrees of visibility in the air unit. Under Armour is set to debut their HOVR cushioning on the “Phantom” training shoe that features Energy Web, which gives you great responsiveness and energy return. The HOVR cushion system will be available in the Record-Equipped package, where you can connect to your device to record your data. The Jordan 32 teamed up with the Retro 6 to celebrate the Chinese New Year. This too will feature an all black look with metallic gold accents, China inspired fireworks and floral embroideries throughout the shoe. 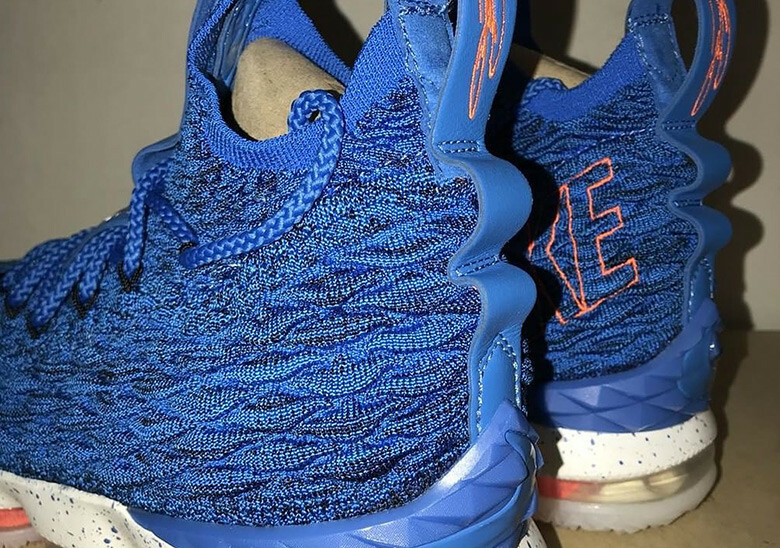 Nike Lebron’s “Hardwood Classic PE’s” are making a comeback but this time in the 15’s. This throwback color way has nice designs on the interior pull tabs and tongue, with Akron’s area code “330”, and his children’s initials “B.B.Z.” As well as the crown logo and a silhouette of his signature dunk. 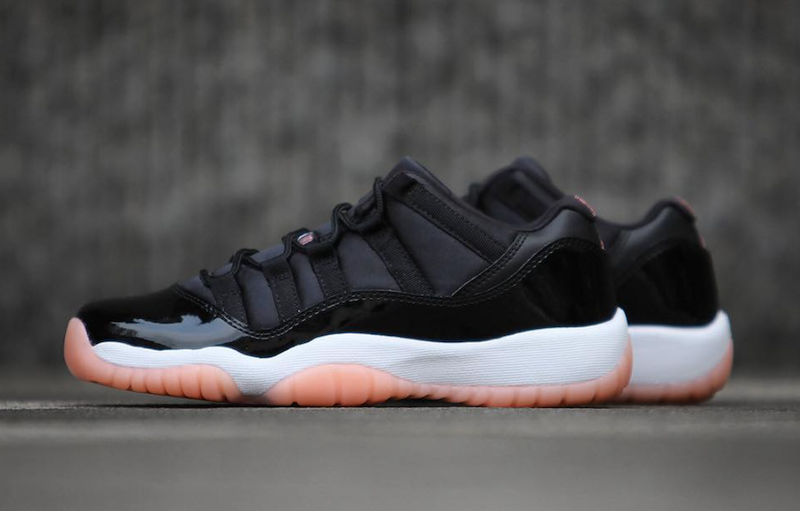 They will also come with a pair of orange laces to switch up the look. The year of the Retro 9. 2018 is the 25th Anniversary of the Jordan 9. With the first release of the shoe planned for February 3rd, Jordan will be giving it a new color way dressed in black and white with gold accents for the City of Flight series. Paul George's 2nd signature shoe is ready to hit the shelves. Starting it off is the collab with PlayStation which celebrates PG's love for the PS4. The details in the shoe are key to the console, with a dynamic winged support overlay wrapped around the heel that displays graphic prints of the PlayStation controller buttons. The shoe lace holes at the base of the shoe also gives a nod to the controller with the colors of the buttons. A special 30th Anniversary of the Retro 3 White Cement is due to hit the stage again but this time with a little twist. The yet to be unveiled shoe will boast in white with fire red, cement grey, and black accents. Reports say that this is the Air Jordan 3 but with a new clear sole and graphic on the upper that will pay tribute to MJ’s iconic Dunk Contest in 1988. We’re in for a surprise. Russell Westbrook finally brings his shoe to the court. With a fused meshed upper, vamp cover, full length Air-Zoom unit & compression-molded pylon foam piece this shoe is engineered for “take off” which fits the reigning MVP’s style of play. Tinker Hatfield's original Air Jordan 3 sketch finally comes to life 30 years after the first release. With a slight modification of the original "Fire Red" model, this colorway adds black upper midsoles, grey mudguards, an OG "NIKE" logo on the side with Tinker's signature implemented on the inside of the tongue. 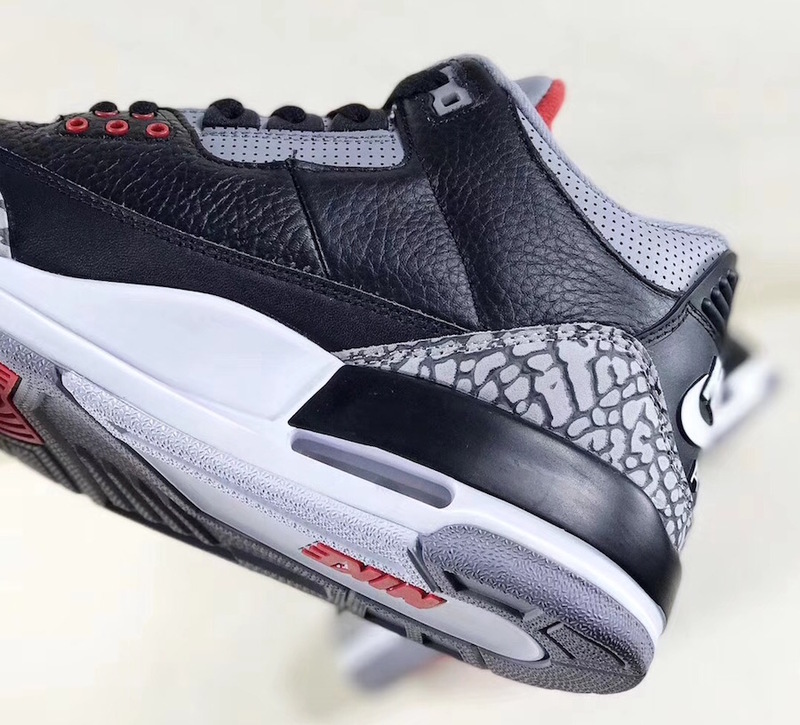 The Jordan Retro 3 “Black Cement” is making it’s return to the shelves in February with the OG Nike Air logo instead of the iconic Jumpman. This version of the sneaker was last seen in 2001 with a similar release in 2013 called the “White Cement” which were a tribute for the 25th Anniversary of Jordan’s unbelievable Dunk Contest performance. The Pharrell NMD Hu Trail is making a comeback in early 2018 with 4 new pairs. Starting off are the “Black Canvas” which features an all black look with purple midsole accents and shoe laces. The multi color interior gives a little life to this sleek shoe. On deck are the all white “Cream”, this is more of a settle look from the Pharrell x Adidas line but still catches your attention. The Off White x Nike collection keeps growing with the Retro 1 but this time in “White”. Debuted at Fashion Week in Paris, it has the same features as the “Chicago” color way, but with a blue hand tag instead of the red. Stay tuned for an official announcement from Nike about the release.